Piggy's Revenge : See you on Sunday morning ! Right now, the forecast is for temperatures in the low 70’s and a 10% chance of rain which sounds like a perfect day. The rain on Friday and Saturday will probably not change the trail conditions very much, if anything it will improve them especially some of the sandier sections on the 60-mile loop. First if you are driving in with a GPS make sure you are getting off I75 at exit 193 Jacaranda Blvd. 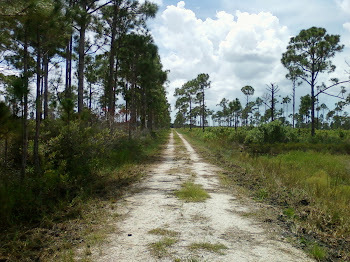 Every year some GPS’s send drivers to the end of Laurel Rd on the wrong side of Myakka River. Once on Jacaranda go North to Border Road then take a right (there is a sign for the park at the intersection) go East to the end of Border Road then left in to The T. Mabry Carlton Reserve (1800 Mabry Carlton Pkwy, Venice, FL 34292. When you get to the park follow the directions from the volunteers to the parking areas, we need to squeeze a lot of cars into two parking areas and along the sides of the gravel road going into the park. Please let us direct you to your designated spot. This year, the registration and start / finish line will be at the pavilion and not in the parking lot as previous years. The sign up process will start at 7:00AM. There will be separate lines for preregistered and day of registrants. If all goes well, we will have a brief riders meeting shortly after 8:00 am with wave starts after that. 60’s will leave first, then 40’s, 20’s and finally the 10 wilderness ride. We have a lot of items from our sponsors to give away during the day so hang around after the race and hang onto your race number. For the 60 miler, you will need to download the GPS file at https://connect.garmin.com/modern/course/11349507 to find your way around since we will only mark the first and last few turns. If you don’t use a GPS plan to follow a rider that does ……YOU WILL GET LOST. Remember you are ON YOU OWN, make sure you are prepared. The 40 and 20 loops will be marked with signs and painted arrows. Sags stops will be around mile 13 (20 and 40) then at 32 for the 40. The sag stop is 25 miles into the 60 and there is a gas station around mile 42. Registration ends tonight at midnight.